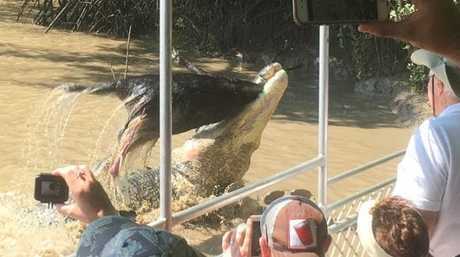 TOURISTS well and truly got their money's worth on a jumping croc tour, when two of the Top End's most iconic salties, Brutus and Dominator, went head to head over a massive pig. 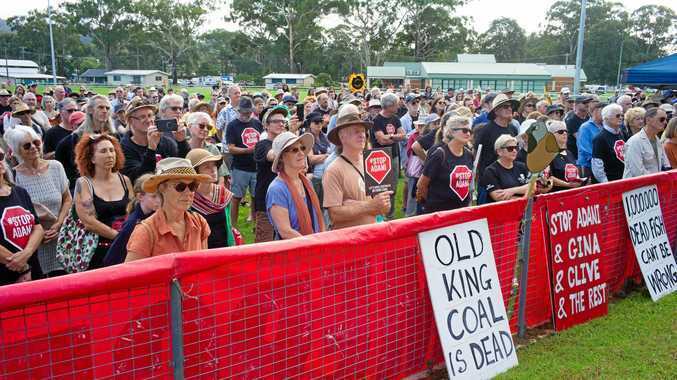 Led by Harry Bowman of Adelaide River Cruises, around 25 people from all over the globe witnessed the saltie scuffle unfold between the two crocs right beside the boat. As the vessel was making its way down the river, Mr Bowman spotted the Adelaide River King, Brutus, munching away on a gigantic pig. "We went right up next to him and that's when we managed to get some incredible photos of him swinging the pig around in his jaw," he said. Saltwater crocodiles Brutus and Dominator fight over a wild pig in front of tourists. "Within a few minutes of that taking place, Dominator snuck up on the other side of the boat and started to take on Brutus, the naughty boy. "They rolled around in the river for a few minutes but luckily nobody was hurt as they haven't got any teeth." Dominator, a 5m saltie, managed to snap up the pig from his 5.3m rival Brutus. "Brutus cowered off after a while as he's a bit of a softie and Dominator continued on down the river with a pig in his mouth and a big smile on his face," Mr Bowman laughed. "Dominator disappeared for a couple of days but he turned up again with a belly twice as big as what it usually is - no doubt full of pork." Mr Bowman said fights between the pair were rare, with the two salties usually residing in separate parts of the river.